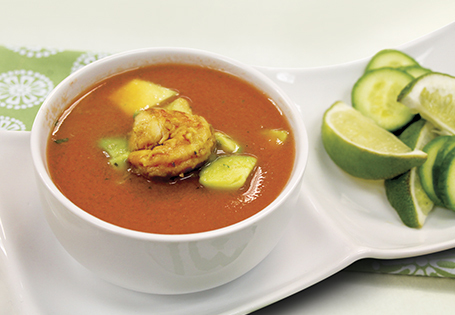 A light and refreshing summer soup with succulent marinated shrimp. In a medium bowl, combine 1 tablespoon honey and 1 tablespoon vinegar. Whisk until honey dissolves. Add 2 teaspoons ginger, garlic, juice and zest from one lime, Sriracha and 1 teaspoon salt. Stir until well combined. Add shrimp; let marinate a minimum of 2 hours to overnight. In a blender, combine remaining 1 tablespoon honey, 1 tablespoon white vinegar, 1 teaspoon ginger, lime zest and juice, watermelon, cucumber and remaining 2 teaspoons salt. Puree until smooth; strain through a mesh strainer. Refrigerate until ready to serve. In a medium pan, over high heat, heat coconut oil. Remove shrimp from marinade; sauté until opaque, approximately 4-5 minutes. Remove from heat, let cool to room temperature. In a medium bowl, toss sautéed shrimp, diced avocado and cilantro until well combined. Divide soup among 8 bowls, top with cooled shrimp mixture. Serve with lime wedges.